Film #1 - The Battle of the Marianas: 1944 - Troops and supplies are unloaded under heavy fire, advance behind tanks through cane fields, 318th Thunderbolts take off from the newly captured Aslito field, as US Marines destroy last enemy strongholds. 20 min. Film #2 - Marianas Thunderbolts: 1944-1945 - Coverage of the 318th FG in the Pacific from Oahu to Ie Shima. Several firsts for the 7th Army Air Force. 77 min. Film #3 - 318th Fighter Group on Saipan: July 1944 -Admirals Nimitz, King and Spruance meet aboard USS Indianapolis, Scenes include Aslito Field and 318th P-47s. Color, 7 min. 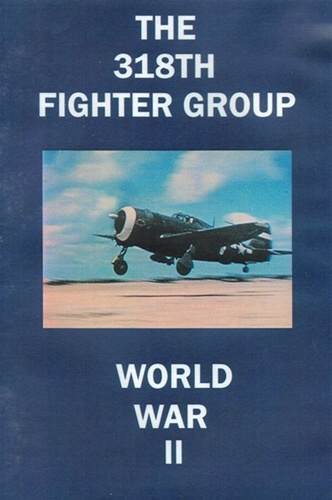 Film #4 - Long Range P-47N Models join the 318th on Saipan: April 1945 - 11 min. Film #5 - 318th Fighter Group Moves to Ie Shima: May-June 1945 - 17 min. Film #6 - Captain Phil Rasmussen Film: 1945 - Color, 2 min. Film #7 - 318th FG Gun Camera Film: 1945 - Color, 8 min. Film #8 - Arrival of Japanese Envoys Ie Shima: August 1945 - Color, 4 min. Total run time for The 318th Fighter Group World War II P-47 DVD is about 2 hours, 26 minutes in B&W and color. Format is NTSC DVD.